By January 2006, when the Russian government launched a tender for the development of the next generation spacecraft to replace Soyuz, RKK Energia conceptualized a new configuration of the Kliper spacecraft. However details were emerging slowly. An officially released photo of RKK Energia's president Nikolai Sevastyanov holding an artist rendition of the "new" Kliper at the opening of the tender was analyzed to death, but it was too distorted by the perspective and low resolution to enable a clear visualization of the vehicle. 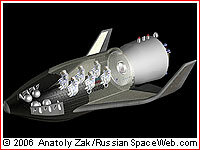 First clear images of the latest configuration leaked from the Proceedings on the Cosmonautics held at Bauman school in Moscow on January 25-27, 2006. A redesigned shape of the Kliper, as well as modifications of the Parom orbital tug became apparent. At the time, RKK Energia kept all options on the table with respect to the launch vehicle. 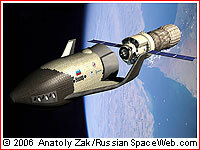 The Soyuz-2, Soyuz-2-3, Angara-3 and Zenit were all under consideration. RKK Energia also returned to the use of the expendable habitation and propulsion module, since the federal tender required a single spacecraft design, rather than a "system." The Kliper with the habitation and propulsion module could still be launched by the Zenit-2 or the Soyuz-3 rockets, while a lighter vehicle could fly later on the Soyuz-2-3. As required by the tender, the Kliper would be capable of lunar missions, and even had a potential for its use in the expeditions to Mars. In the meantime, studies of Kliper's aerodynamics during 2005 resulted in drastic changes in the shape of its fuselage. In the effort to reduce heat loads on the underbelly of the vehicle during the reentry, engineers "rounded" a previously flat bottom of the vehicle. The wing structure was now attached to the fuselage at a higher position than before. A somewhat flattened fuselage now held a cylindrical crew compartment and a conical nose section. The crew members would now sit in pairs in three rows, instead of previous two rows with two pilots in front and four passengers behind. In the meantime, on March 14, 2006, Nikolai Sevastyanov, the president of RKK Energia announced that his company completed preliminary design of the Kliper project. 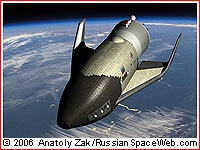 The vehicle was expected to enter service before 2015, according to Sevastyanov, with first launches planned for 2012. On April 26, 2006, Sevastyanov said that RKK Energia had completed changes in the Kliper project to accommodate latest requirements of the federal tender and was expected to submit it to the government on April 27. According to Sevastyanov, the organization was still proposing a winged version of the vehicle for missions into the vicinity of the Moon, but modified its thermal protection system to enable the reentry into the Earth atmosphere with higher velocity than that during the return from the Earth orbit. In addition, RKK Energia dropped the Ukranian-built Zenit-2 rocket from the consideration as the launch vehicle for the Kliper, opting instead for the Soyuz-2-3 booster. On July 19, 2006, Russian space agency, Roskosmos, announced that it deferred the development of the new manned spacecraft until the next stage in the modernization of the nation's manned transport system. In the meantime, the agency accepted alternative proposals from RKK Energia to conduct a radical upgrade of the Soyuz spacecraft, in order to give it the capabilities for circumlunar missions. Despite all setbacks for the Kliper project during 2006, RKK Energia leadership insisted that the project was alive. 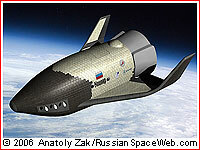 During Paris Air and Space Show in Le Bourget in June 2007, Russian press quoted the company's officials as saying that the development of the spacecraft was continuing and it could fly by 2015. A newly appointed head of RKK Energia Vitaly Lopota confirmed his support for the program on July 31, 2007, telling Russian reporters that his corporation was refining the design of the spacecraft and was planning re-submit the project to the Russian space agency, Roskosmos before the end of 2007. However in the September 2007 interview to the Delovoi Peterburg newspaper, Lopota indicated that the concept of the Kliper, as a "lifting body" vehicle was dropped. 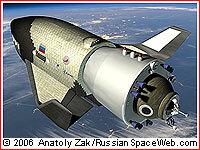 Instead, RKK Energia was evaluating four competing configurations of a reusable spacecraft. 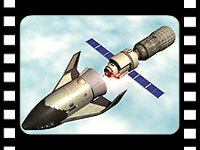 Lopota, again reitirated that his company was expecting to finalize coordination with the Russian space agency, Roskosmos, the new concept of the spacecraft before the end of 2007. (259) As it transpired, Lopota apparently referred to the next-generation spacecraft, designed to replace Soyuz, not the winged Kliper in its 2006 configuration.